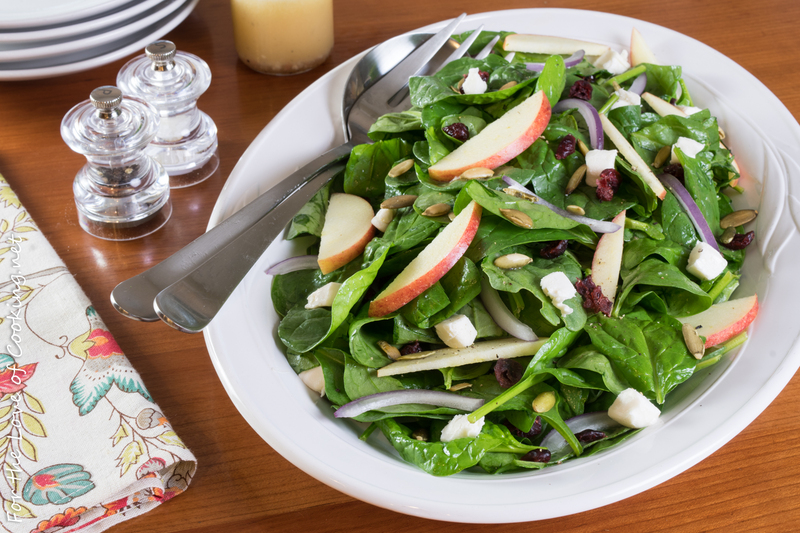 Prepare the salad by combining the spinach, onion slices, dried cranberries, and toasted pepitas together in a bowl. Whisk the vinaigrette well then drizzle some on the salad, to taste. Toss to coat evenly. Pour salad into the serving bowl then top with freshly cracked black pepper, to taste, apple slices, and goat cheese crumbles. Serve immediately with additional vinaigrette on the side. Enjoy. 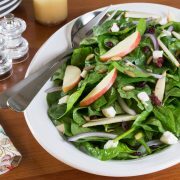 Prepare the salad by combining the spinach, onion slices, dried cranberries, and toasted pepitas together in a bowl. 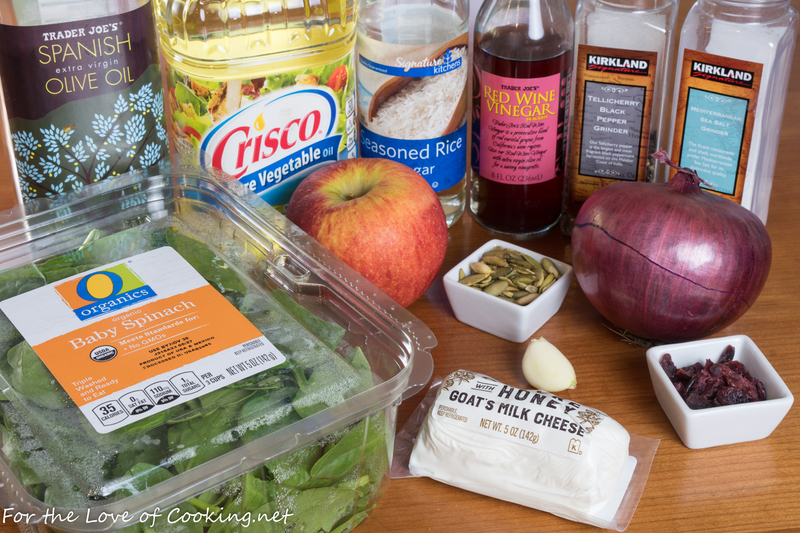 Whisk the vinaigrette well then drizzle some on the salad, to taste. Toss to coat evenly. 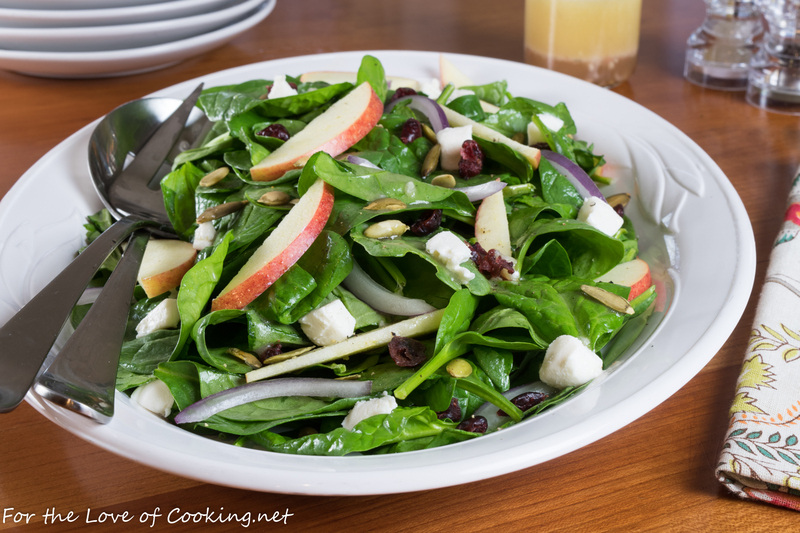 Pour salad into the serving bowl then top with freshly cracked black pepper, to taste, apple slices, and goat cheese crumbles. Serve immediately with additional vinaigrette on the side. Enjoy. This salad looks wonderful !!! I like a touch of nuts with this kind of salad. Or maybe I’m just a touch of nuts – I forget. I could eat this as a lunch salad on its own! So many great flavors and textures.